Books at Estate Sales = FTW! When Rebecca is given the choice to join with Adam, she sees an opportunity to become something few humans will ever experience, and soon becomes one of Adam’s special disciples, able to keep her own unique self while still melding with him. Through his digital eyes she sees more death and destruction than she could imagine. As she hears the quiet voice of Mosasa in her head, she realizes that Adam is fallible and there may yet be a way to stop him. Back on Salmagundi, the Protean Construct is be made of the same technology as Adam, but he uses it differently. The Protean will not force his ways on anyone, but offers to help those who ask. The nameless Protean sacrifices himself to save Nickolai, Kugara, and the other escapees. His dying words are clues regarding how to stop Adam. In all the chaos, will Kugara and the others get the message out in time? In between all the action, Swann gives us some much needed and much appreciated history of the Race AI’s. The technology was foreign, but wielded by a human who didn’t realize the secret orders sleeping in his creations. The man died, and his creations lived on, spying on the Confederation, building plans within plans to one day have their revenge on humanity. The AI’s slowly broke down, or went mad, until only Mosasa and Adam were left. Back on Earth, the Vatican and other Earth governments know Adam is on his way, and panic sets in. When a Protean emmisary pays a visit to the Vatican, the solution offered could easily be a trap. Ending on a cliffhanger, Heretics is unpredictable, enjoyable, and hard to put down. The final battle could go any way, and the fate of all of humanity’s descendants are at stake. 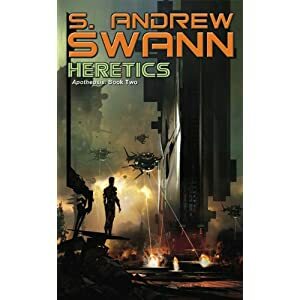 If you enjoy futuristic space operas, questions about ethics and faith, super-bad guys with superpowers, and cheering for the underdog, you will like S. Andrew Swann’s Apotheosis series. I’ll admit, some of the religious bits at the end caught me off guard, and I began to wonder if Swann had some underlying religious message he was trying to get out. After reading some of Swann’s more personal writings on his website, I came to the conclusion that Swann is just using religion and faith to expand on an age old question: What do you do when God, or something claiming to be God shows up? When an omnipresent, omnipotent being shows up promising paradise to followers, how do you tell billions of faithful they are wrong? Perhaps his underlying message is that science fiction is the perfect platform to ask these kinds of questions.